At this time of year I really like the skeletal structure of beech trees and the patterns branches can make against the sky. This photo was taken near Nuffield next to Grim's Ditch before it descends off the Chilterns. It was a magical misty end to the day but as the sunset wasn't too spectacular I decided this image was best in monochrome to emphasize the structure of the trees. 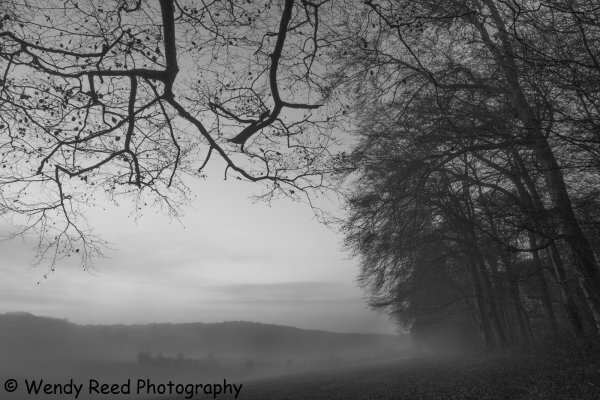 I like that the beech trees provide the three main elements of the picture, twisted branches in the foreground, a row of trees receding into the background and the far trees in the fog.